value added tax (TVA) from the government agencies. by dock workers added to the woes of exporters. 1 December following its ratification by the two countries. build understanding of good forest governance. 2011, the second covers activities and progress in 2012. 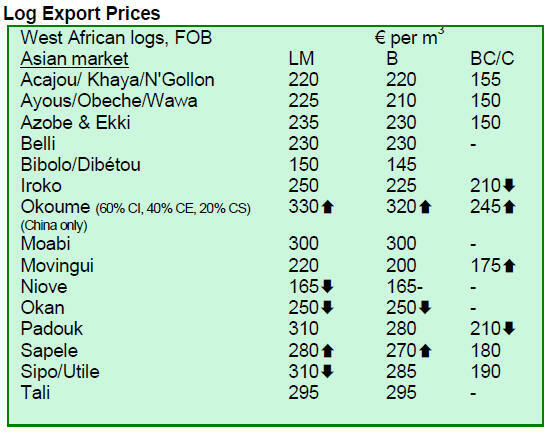 Development of the Wood Industry in the Congo Basin. 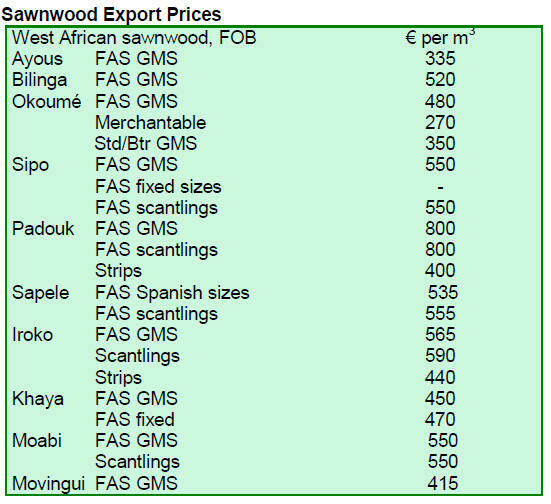 scenarios for the wood industry in the Congo Basin. address one of the programme‟s thematic areas of support. Grants of up to euro 100 000 will be available. be available in January on the programme website. verification protocols and wood tracking system. many challenges facing the forestry sector. about 10% of gross domestic product. implementation of the new Forest and Wildlife policy. statement by the Minister of Finance Mr. Seth Terker. 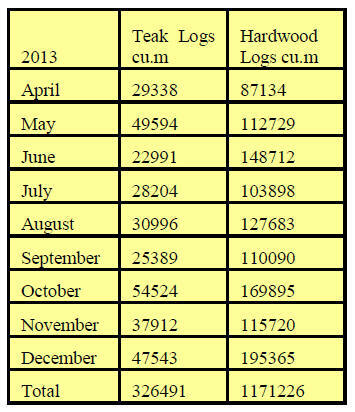 The year has started quietly for the timber industry. till after the Chinese New Year which falls on 31 January. government on proposed changes to timber royalty rates. US$240 per cu.m in 2013). season and because the rupee exchange rate stabilised. FLEGT VPA to explain its position. which is on a voluntary basis. products from Sarawak are illegal. definitions of what is legal timber. benefit of the timber industry internationally as a whole. they come from areas covered by SVLK certificates. log trading would be mainly driven by market demand¡±. use of wood products by government agencies. to be in place this year according to Bachrul Chairi. the EU FLEGT Facility Newsletter of Nov/Dec 2013.
assurance system conducted in 2013.
new legislation and capacity building. various log depots in Myanmar. loading of logs bound for export will be halted. 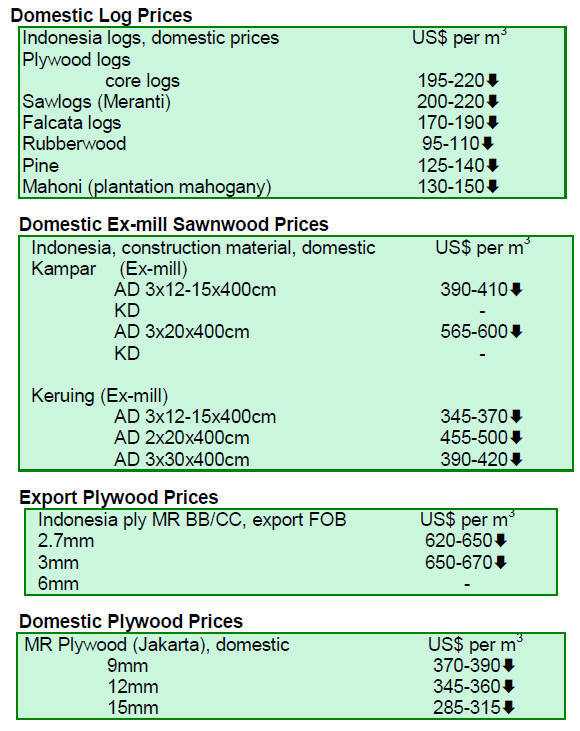 prices provided the logs are processed inside the country. become the property of the MTE and sold by open tender. factories from the private sector. fall in the category of Grade 6 will be sold as Grade 7. Grade (ER) will be called Domestic Quality. Reject Grade will become Second Quality. in Yangon and in other suitable locations outside Yangon. 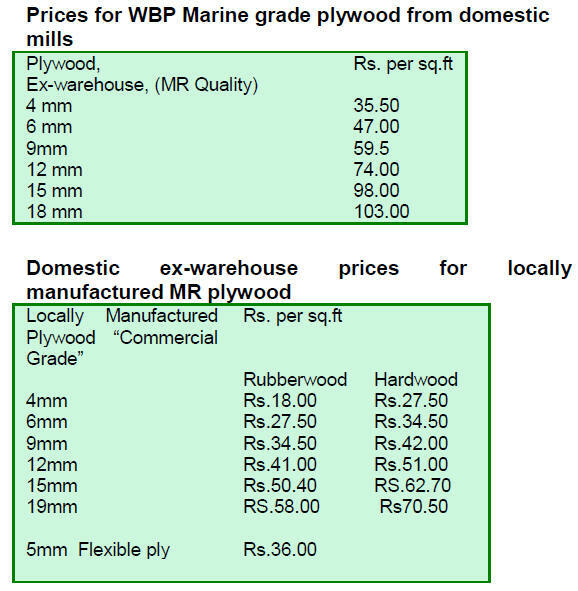 13 and 16 December 2013.
directly affects demand for wood products. offer discounts and free extras not part of the normal deals. will resume and prices will respond accordingly. Acquisition Act which came into effect on 1 January 2014.
per cent to development costs. owners will see higher prices being paid by the state. of the trade agreement between ASEAN countries. annually with China being the major supplier. will have an opportunity to expand exports to India. period when auctions do not take place. 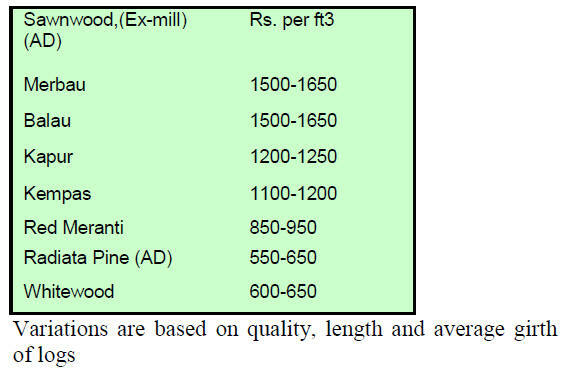 logs were priced at 400 ~550 per cu.ft. put up for sales in coming months. Indian buyers are pressing for reduced prices. suppliers and holding down prices. 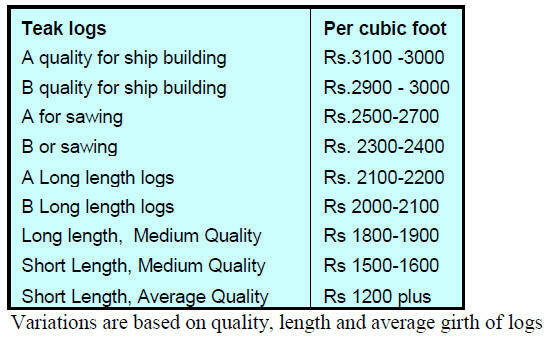 ports per cubic metre are shown below. 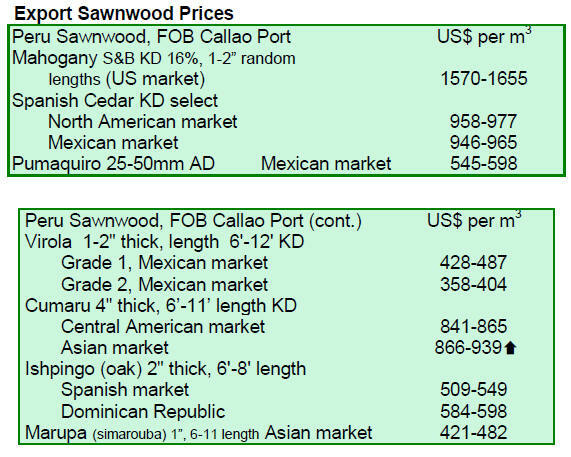 not changed so sawnwood prices remain unchanged. teak products is only from selective high net worth clients. sawnwood per cu.ft are shown below. but the current demand is not supportive of this. products used for event venues to be certified. indigenous people issues and local community‟s rights. the Olympic Village were FSC certified. economic activities is respecting the environment. developments between 2009 and 2013.
exports, tax levels and employment. Grosso‟ (PDFS/MT) due to be released in February 2014.
sustainable forest-based industry in the state. 2013, earning some US$93.7 million. up 4.1% year on year and export earnings were up 1.5%. million, 5.9% more than in the same period in 2012.
to US$ 42.8 million of the previous year. the second half of the year prices recovered. furniture sector expanded output by over 6%. within the requirements of the Forestry and Wildlife Act. 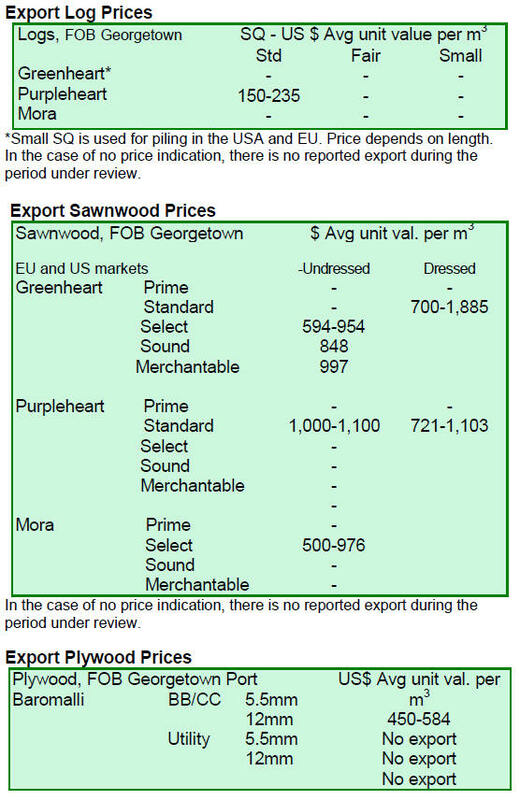 market for the export of purpleheart logs was Asia. the market price was only fair at US$848 per cubic metre. category earning as much as US$1,100 per cubic metre. attracts buyers in Central America and the Caribbean. US$649 per cubic metre also in Caribbean markets. 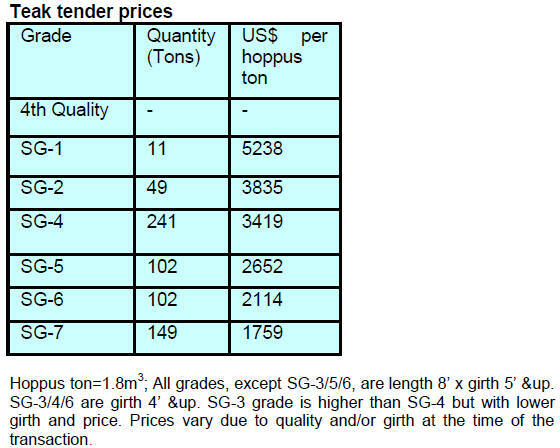 prices in the region of US$977 per cubic metre FOB. their way to the Caribbean markets.